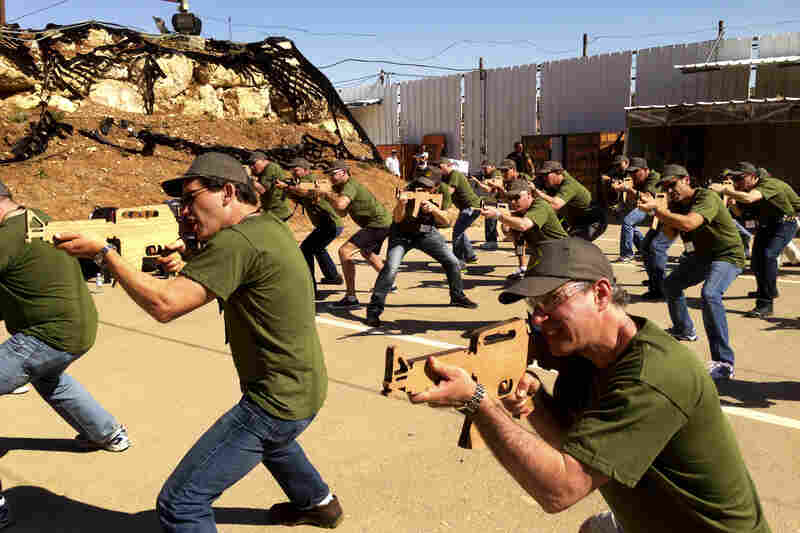 Businessmen from Philadelphia practice with wooden cutouts of rifles at Caliber 3, a counterterrorism training center in an Israeli settlement area south of Jerusalem. 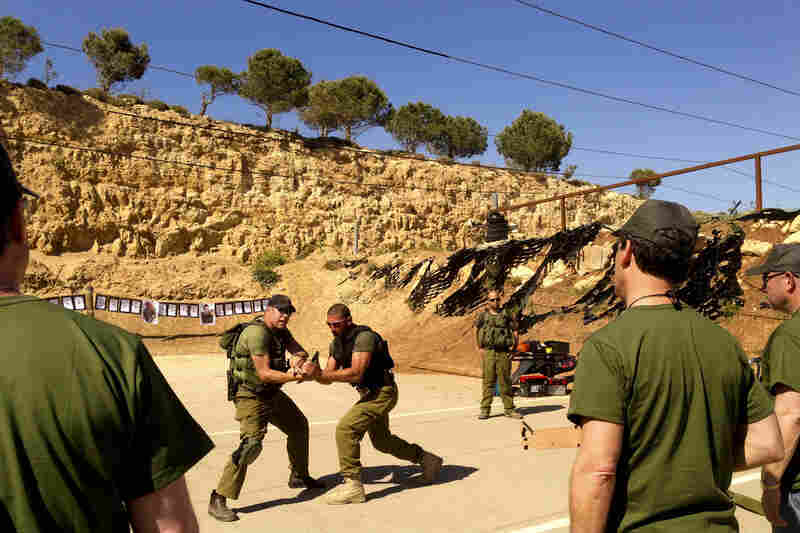 For a price, tourists interested in Israel's security can spend a few hours learning counterterrorism techniques. Hand-to-hand combat is part of the two-hour training. The vistors first train with wooden rifles then move on to real weapons. Trainers instruct visitors to stand with their feet at a 45 degree angle for stable shooting. 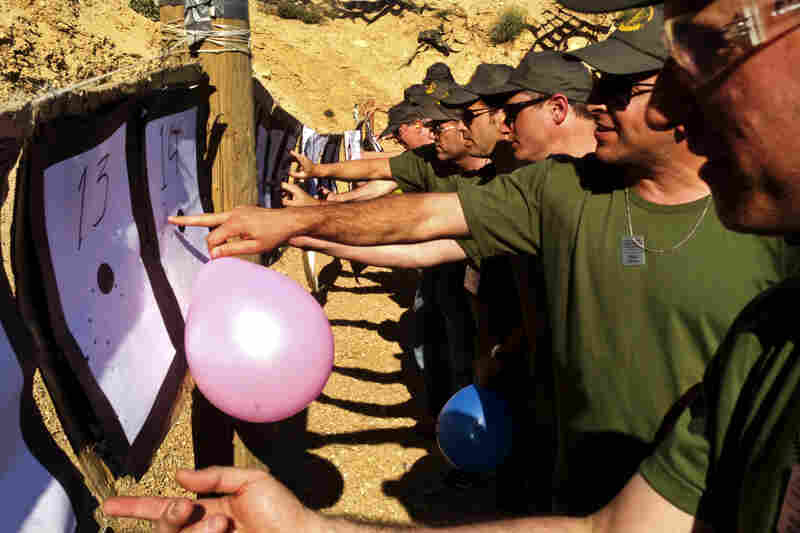 For the final round, the American tourists shoot at balloons during target practice. 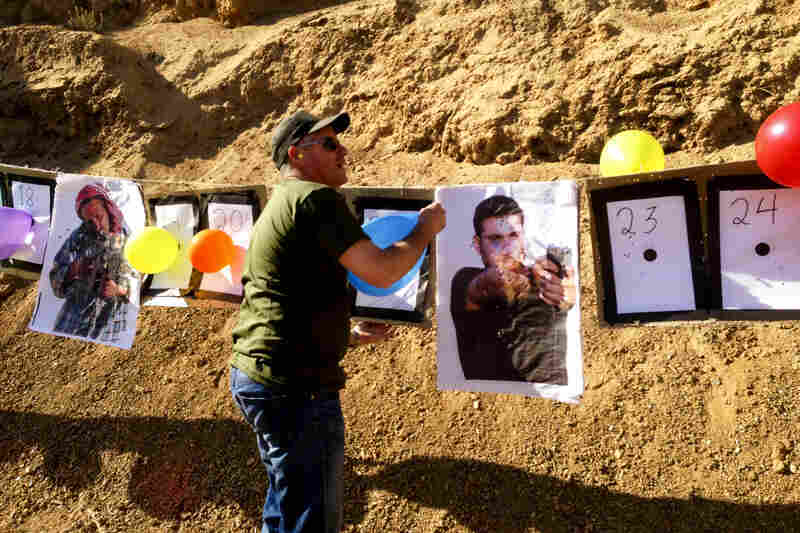 A tourist commando gets one-on-one instruction during target practice. 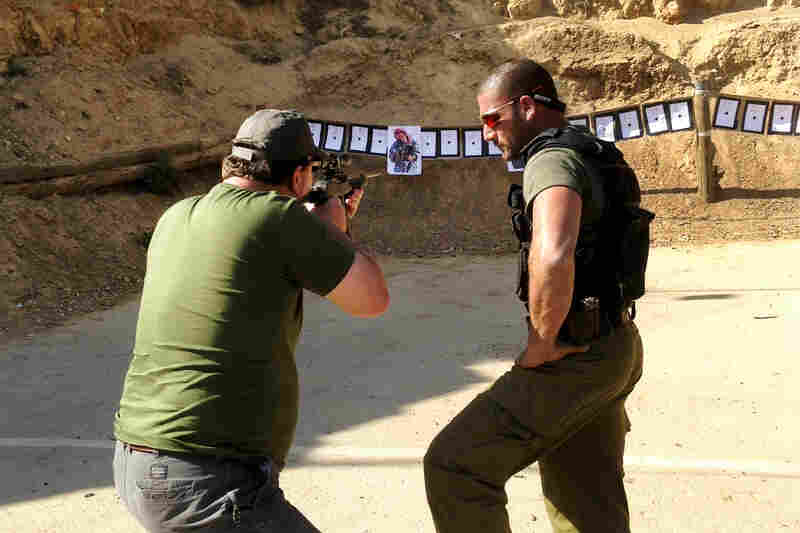 The tourists compare hits after two rounds of shooting. 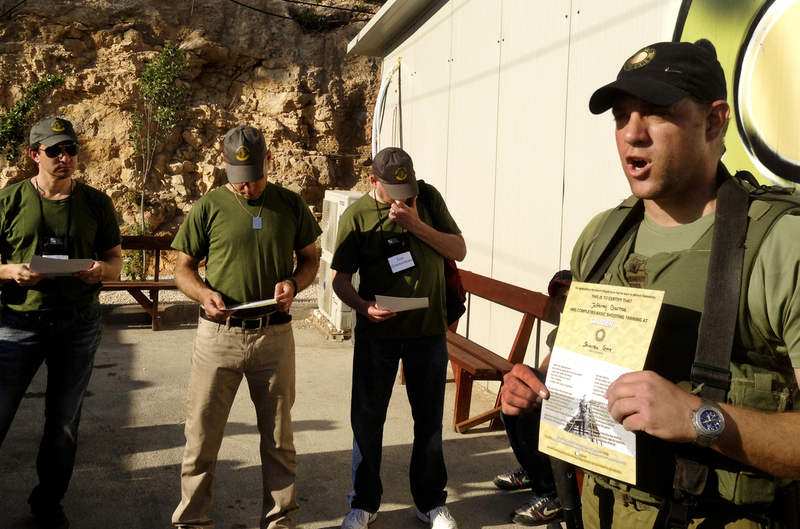 Instructors at Caliber 3 have served on a variety of special forces units in the Israeli military. The tourist commandos line up for a race in which they run, do push-ups and shoot. 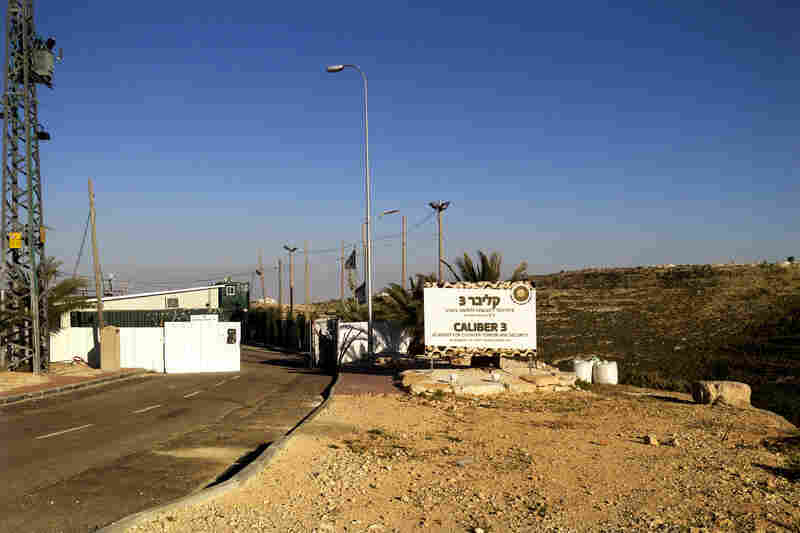 The training facility sits on a hilltop in the Gush Etzion region of Israeli settlements in the West Bank. 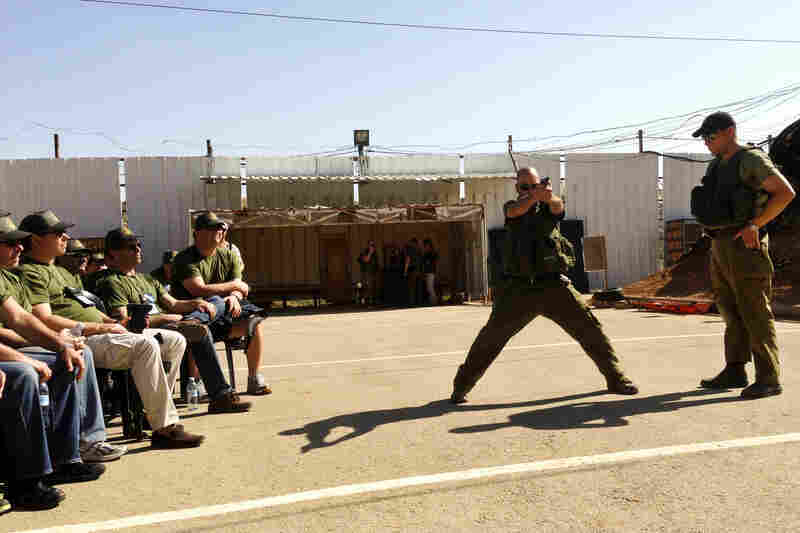 Gar is an instructor at Caliber3, a private counterterrorism training center in an Israeli settlement area south of Jerusalem that offers short shooting courses for tourists. Wrapping up the Americans' two-hour session, he called them all to gather around. First, he told the story of Hagai Haim Lev, an American-Israeli and captain in the Israeli military who was shot by a Palestinian sniper while searching for weapons in Gaza in 2002. Lev was related to Caliber3's founder by marriage, and tourists who go through the training here get a certificate with his photograph and a poem written in his memory. Caliber 3 instructor Steve Gar talks about Capt. Hagai Hayim Lev, a soldier who was killed leading an Israeli military operation in the Gaza Strip. Gar then told his own story. He grew up in South Africa and immigrated to Israel on his own. He says he spent five years in a religious youth movement in Australia, married an Israeli immigrant from Canada and fathered four children. Gar is good with imagery. 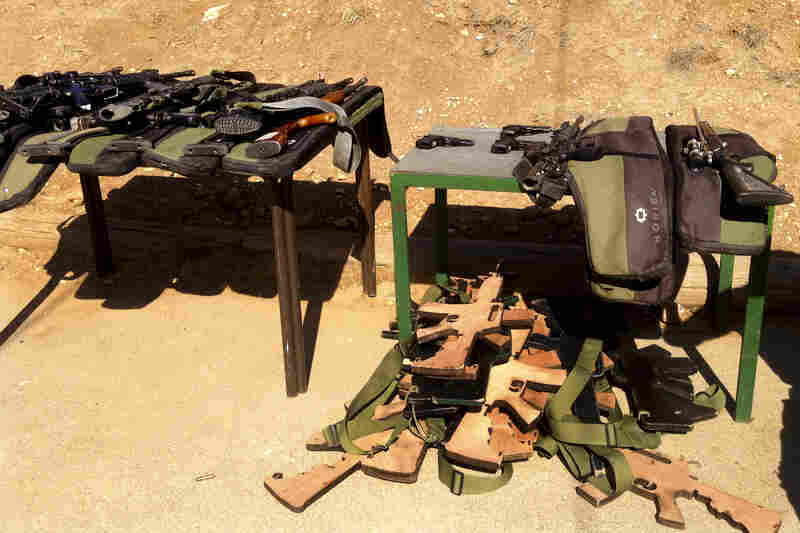 As a reservist with a counterterrorism unit, he always has two weapons with him. "It looks a bit odd," he says, but he pushes his young twins in a stroller to synagogue with an M16 strapped to his back. 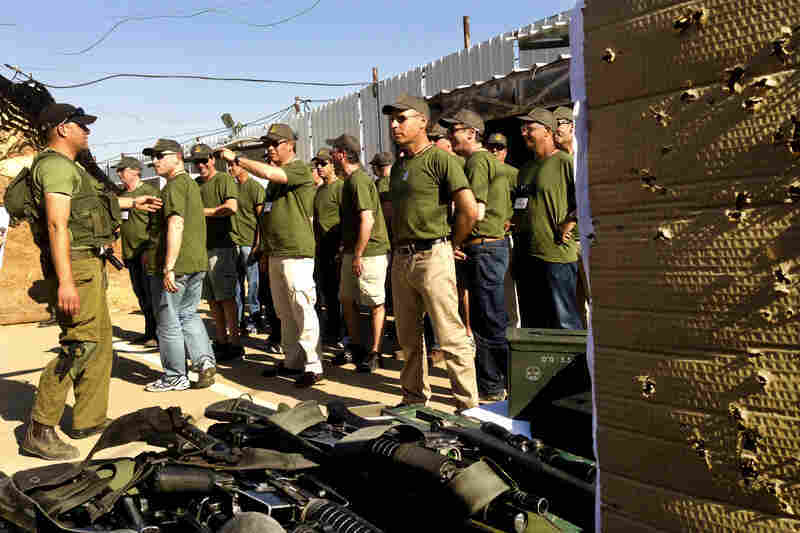 In addition to his counterterrorism service and teaching at Caliber3, Gar told the group he is studying to become a rabbi and runs a Torah program for Jewish youth with special needs, like Down syndrome and autism. "I wanted to tell you this because I want you to see what we're all about," he says. "I'm a family man. I see myself as an educator." About his military work: "We do this because we love, we don't do this because we love killing." Gar asks the American visitors to "help fight terrorism" by speaking up against negative views of Israeli soldiers they might see or hear back home. To seal the deal, there's one more story: Gar describes how five members of a Jewish family — a husband, wife and three of their children — were killed two years ago in their home in the West Bank settlement of Itamar. He says he was part of the team that took two Palestinian suspects back to the family's house to re-enact the murders, using toy knives and dolls. "They had smiles on their faces as they went from room to room slaughtering a family," Gar said. "Once they left, they heard a baby crying. They responded. One terrorist held the baby while the other took a knife and slit her throat." 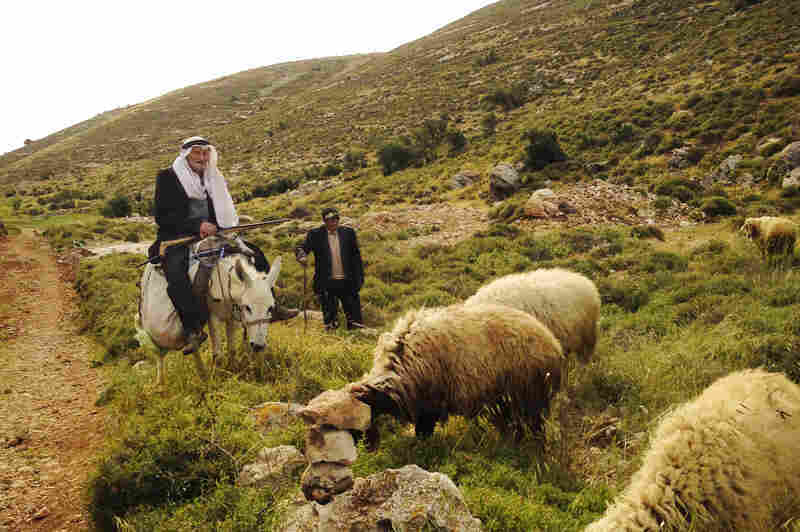 In the valley below, Palestinian farmers graze sheep. One farmer says the shooting from the range scares him. Another says he hears it all the time, but what really bothers him is when Israeli soldiers close access to this land. Published reports of the re-enactment don't fully match each detail of his memory, but Gar's narrative clearly moves the men he's talking to. "They take you from high adrenaline to emotion," says Scott Erlbaum, who runs a chain of retail flooring stores in Philadelphia. "I'm probably not an objective observer, but the news does not portray what's going on here accurately. "A lot of the times the IDF [Israel Defense Forces] soldiers are looked at as the bad guys because in combat and in battle children do die sometimes. And it's sad and it happens on both sides." Which side is right in the Israeli–Palestinian conflict? Which is wrong? The battle to have one narrative seen as more legitimate or more just than the other often permeates ordinary conversations here, and certainly many interviews. In a field below the Caliber3 site, an old Palestinian farmer trims his apple and almond trees by hand. I want to ask him about living close to the military training range, but before he can focus on that specific issue, Mahmoud Mershed has a much bigger story to tell. "The Israelis put in a fence to keep me from using the road to get to my land," he says, gesturing toward a spread of fruit trees and grapevines covering about 60 acres. "I have to come through the valley, on my mule." We've come along the same bumpy, twisty route — though we've used a truck with four-wheel drive instead of a mule. Right across the paved road Mershed does not have access to, an Israeli welder in modern safety gear builds the frame of a new building. "I don't bring my sons with me to help any more," Mershed continues. "My son had a heart attack here once when we were surrounded by settlers and there was shooting. He died. Now I come alone." When we get to the shooting range, he says he hears the gunshot practice all the time and it scares him. Mahmoud Mershed and Steve Gar will probably never hear each other's stories.